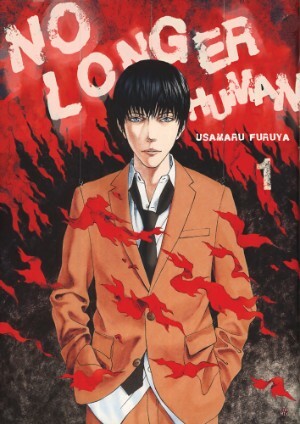 MICHELLE: This month’s Manga Moveable Feast, currently in progress, is devoted to the works of Usamaru Furuya, prompting Melinda and me to devote this week’s column to the most recent of his series to see publication in English, No Longer Human. 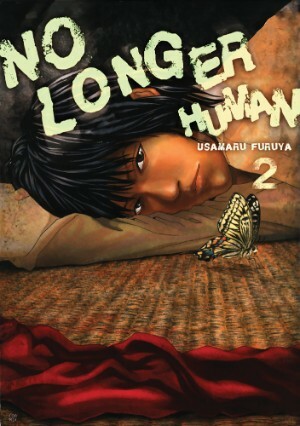 Based on a book by Osamu Dazai that’s described as “a decadent novelist’s autobiographical masterpiece,” No Longer Human depicts the story of Yozo Oba, a young man with no comprehension of what it feels like or how to be an ordinary person. We first meet him as a high school student, where he has learned that being the class clown is the one thing that enables him to connect to his classmates. Soon he falls in with a group of misfits plotting political rebellion, but he’s more comforted by being among outsiders than he is honestly devoted to their cause. There, he meets the first of several women who will be drawn to him and agree to feed and care for him. This becomes his pattern in life. By the middle of the second volume, he’s twenty and living with a much older woman while drawing a gag manga and helping out at the bar she owns. He realizes that he’s “a genius parasite on women,” but sees that as his only option left to survive. MELINDA: As in most “decadent masterpieces,” Oba’s excesses drive him deeper and deeper into tragedy, as he drinks and sleeps his way from one safe haven to another, usually leaving the women who care for him in significantly worse condition than he found them (and in one case, even dead). The narrative lets us know that things are only going to continue to get worse, yet it’s impossible to look away. Though there have since been at least two other graphic novel adaptations of Dazai’s original, where Furuya goes very much right, in my opinion, is in his decision to move the pre-WWII story into the present, which I think is at least partially responsible for his ability to present such a self-indulgent tragedy in a way that makes it genuinely readable. I realize the original is a classic, but I feel like the novel might suffer more from a contemporary reading than Furuya’s adaptation does. MICHELLE: I was surprised by just how readable it was, actually. Just looking at the plot, you’d expect it to be depressing, but it’s so skillfully done that I enjoyed it very much! But yes, you’re absolutely right that updating the story was a smart choice, especially as it enabled a bit of self-insertion on Furuya’s part. Ordinarily, I’m kind of annoyed when mangaka break the fourth wall—particularly if they do so in a silly way—but here, Furuya’s interludes of discovering and being transfixed by Oba’s story are absolutely essential in setting the mood. We feel like he’s captivated right along with us. MELINDA: Yes, he’s sort of sharing it with us like a guilty pleasure, and it really works as one. I think the story benefits greatly from being presented as an outrageous internet diary that’s impossible to stop reading. There’s something about this story that makes me feel like I’ve stayed up all night reading, strung out on caffeine and cheese puffs, and, frankly, that really suits it. I kind of wish I’d read it like that for real, actually. Talking about it like this, it would be easy to gloss over Furuya’s artistry, though, which is put to pretty spectacular use in this series, wouldn’t you agree? As for Furuya’s artistry, I whole-heartedly agree. His talent was on prodigious display in Genkaku Picasso, the only other series of his that I’ve read, but it really suits a darker story like this one. I was particularly struck by the depictions of Oba as a marionette controlled by his father’s money and/or putting on a show for his peers. It’s such a vivid symbol of someone going through the motions of trying to be normal! And even though Furuya occasionally uses some symbolism that might seem overly obvious—like the surfeit of bugs lurking beneath the petals of the flowers Oba admires with his fiancée (we must return to this point)—it’s done with such finesse that it doesn’t seem trite. MELINDA: My previous experience with Furuya has consisted only of Lychee Light Club, which I found visually striking on a nearly theatrical level, but juvenile and kind of emotionally empty. It’s nice to see his gifts utilized so differently here. 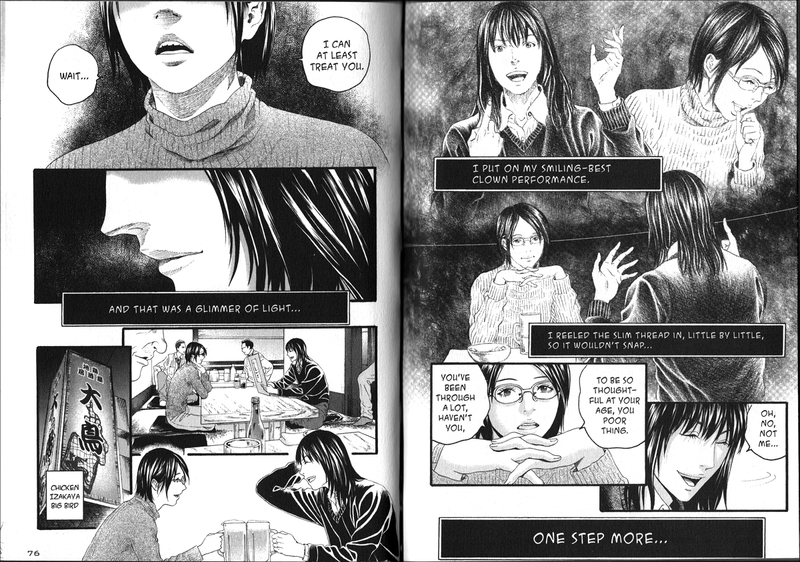 There was a lot of sexually-charged violence in Lychee Light Club, and certainly there’s no lack of sexual themes in No Longer Human, but it’s approached so differently… it really feels like a much more mature work. MICHELLE: I did wonder how this compared to Lychee, which I still need to read. I wanted to ask… did you find the sexual content as supremely unsexy as I did? Beyond not being idealized at all, there are some closeups of things like twirling tongues that look downright disgusting, almost like something drawn by Junji Ito! I wonder if this is Furuya’s way of depicting the impure motives of Oba in these situations. It would be completely out of place to portray what he’s doing as titillating, let alone dreamy. MELINDA: I don’t know if I’d say that I found it supremely unsexy, but it definitely does not read as something that’s supposed to be titillating. It’s interesting, too, even though the character confesses early on that his frequent, semi-anonymous sexual encounters are the only things that make him feel good (“When I’m here seems like the only time the smile on my face in genuine”), from the reader’s perspective, he seems just as detached during those trysts as he is the rest of the time. I almost feel like he’s fooling himself when he says that, and that this is reflected in Furuya’s artwork. MICHELLE: There’s definitely a lot of emphasis on what makes Oba comfortable in a relationship. With the ladies in the “massage parlors,” it’s because he doesn’t have to use any subterfuge. With the members of the political group, it’s because everyone is a misfit in some way. And the two loving/honestly affectionate relationships he has are with women who exhibit a sort of elegant melancholy. Outsiders themselves, in a way. But speaking of fooling himself, what on earth is going on with the abrupt change in the end of volume two?! Oba has maintained all along that he has no interest in and cannot fathom embarking upon ordinary relationships, and yet here he is, falling in love with and ultimately proposing to a virginal girl who works in a smoke shop. I’m sure he’s got an idealized version of her, but man, I just wanted to shake her and go, “Yoshino, no!” That poor girl is in for a very rude awakening. What will be her price for associating with Oba? MELINDA: Yes, disaster is clearly just around the corner, in the same sure way as you’d expect in, say, a Dickens novel. Yoshino is doomed just as it seems Oba is truly doomed, and nobody’s even trying to hide it. Furuya makes the most of this, too. 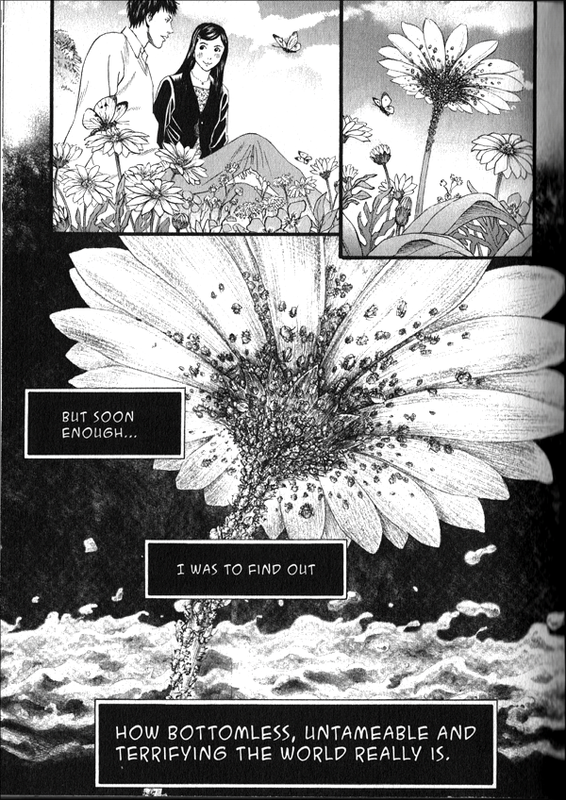 I’m glad you mentioned that last page in the volume, with a swarm of insects seemingly prepared to devour a flower. It’s a melodramatic image, I suppose, but so perfect for the tone of the story. MICHELLE: Exactly! He just seems so much like a different person here from his behavior, which is emphasized by the drastic haircut Furuya has given him. It really comes out of nowhere, narratively speaking, but I have faith that Furuya is going to make it all make sense in the end. I suppose it helps knowing that, theoretically, all of this did happen to the same protagonist in the original novel (and in the life that it’s based upon?). MELINDA: Well, I don’t know if I’d say he feels like a different person, but definitely a different version of a person who keeps reinventing himself over and over, in order to survive. Or perhaps I should say, “in order to survive without having to ever put himself out or curb his own desires,” because really, that’s what his survival is about. So here he is, seemingly falling in love for real for the first time ever, yet in a way, what I see is a guy who has finally figured out how to reinvent himself on the inside–enough to fool even himself. And really, that can’t go well. MICHELLE: Maybe it’s all the drinking he’s doing that’s enabling him to fool himself to such an extent, to actually believe in one of these personas he’s crafted for himself. And I think there’s a line in there, too, about how living with Mama (do we ever learn her real name?) is so peaceful and great that he starts to believe that all the world is the same. But ultimately, he’s still pursuing the kind of parasite arrangement that’s been sustaining him the past few years, but viewing it through the illusion of love. MELINDA: And in a way, maybe that’s the only direction he could really go at this point. After having finally become too disgusted even with himself in his usual arrangements, he’s gotten by with Mama (no, I don’t think we know her real name) because she lets him off the hook so completely. He’s able to be a child, a lover, an employee, whatever, but ultimately she’s just letting him play at those roles without expecting him to be any of them. He can’t go back to what he was exactly, so what else would he do but move on to something he could play at wholeheartedly with someone who is unlikely to notice? Yoshino’s lack of experience makes her the perfect fit for this phase, because she won’t burst his bubble, at least not for a while. MICHELLE: And I’m sure she’ll temporarily inspire him to clean up his act—stop drinking, stop blowing the income he makes from his manga—but it just can’t last long. And maybe one could look at that like a good thing, but I kind of hate him for inflicting himself on her. It’s like, what he sees as the best thing that’s ever happened to him, I see as the worst thing he’s ever done. MELINDA: Yeah, I agree. Not that the other women have deserved him or anything, but to some extent they’ve enabled him by giving in to their own issues and insecurities. They’ve knowingly let him manipulate them (even if they hid it from themselves as best they could), but Yoshina isn’t worldly enough to grasp what’s happening or what kind of guy he is. And on some level, he knows that, and is taking advantage of it. I feel almost cruel, not giving him any benefit of the doubt here, but the guy hasn’t given me anything else to work with! MICHELLE: Whereas I don’t feel cruel at all! He’s been very frank about his own shortcomings and survival tactics throughout. I rather wish I knew more about the source material or the other adaptations, so as to pinpoint which elements have been introduced by or presented best by Furuya, but on the other hand, I don’t want to muddy my mind with other versions of the story when I like this one so much. MELINDA: I admit I suspect I wouldn’t have much patience for the novel at this point in my life. There was a time when I really loved self-indulgent tragedy, but those days are long past. I think Furuya’s wry adaptation may be exactly the thing for me now, and I feel content to leave it at that, at least for the moment. Perhaps I’ll change my mind after I’ve read the end. I’m pretty anxious to read volume three at this point. MICHELLE: So am I! And I think I’m going to go back and read Lychee soon, too. I was unsure about it, but now I feel confident I could admire it, even if it doesn’t reach the heights of No Longer Human. Too bad CMX folded before they could release any of 51 Ways to Save Her. MELINDA: I’m regretful about that now, too. Let’s hope someone else picks it up soon! For more Furuya talk, be sure to check out this month’s Manga Moveable Feast, hosted by Ash Brown at Experiments in Manga. All images Copyright © Usamaru Furuya 2009, Translation Copyright © 2011 Vertical, Inc.
Having read the novel, I can assure you that Furuya is following the events faithfully. 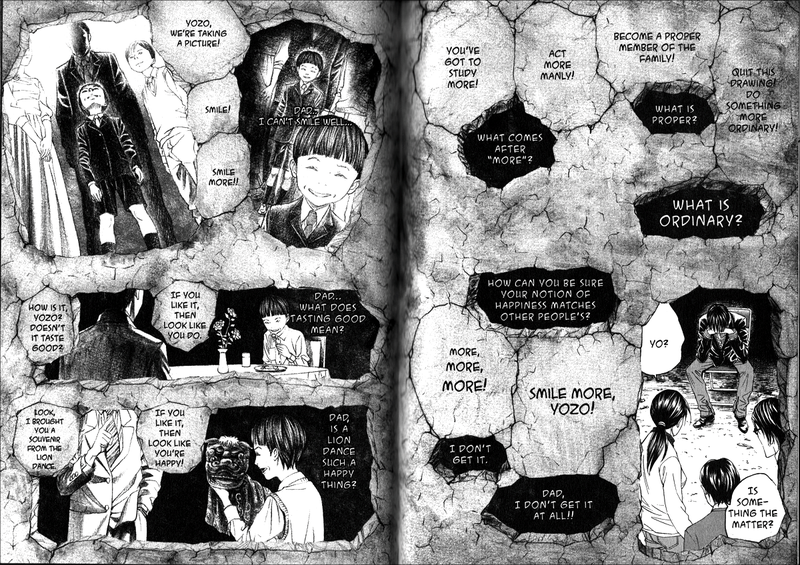 The only thing he omitted was some material in the “first notebook,” which covers Yozo’s childhood relationship with his family. I was disappointed to see those scenes trimmed from the manga, as they’re some of the best-written passages in Dazai’s book. Given their interiority, however, I can see why Furuya chose not to incorporate them into the story. As for the novel itself, the tone is a little different than the manga. Furuya plays things a little straighter than Dazai; finishing the novel, I wasn’t entirely sure that the reader was meant to pity Yozo. 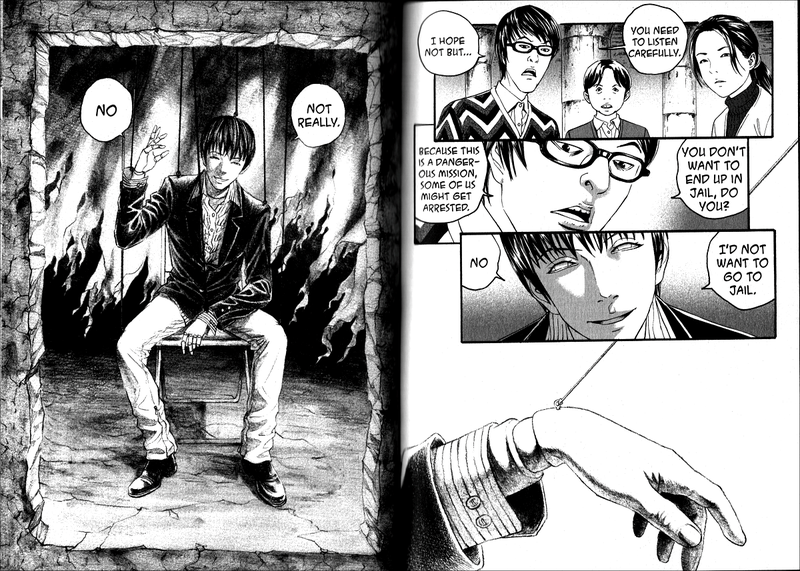 The narrator’s voice is more ambiguous, inviting more interpretations of the story than the manga. That’s not a knock on Furuya, by the way, just an observation. I happened to like the novel better, but I think Furuya’s interpretation is thoughtful and well-executed. Oh, interesting! Well, now I’m feeling like I really should read it. Thanks for the insight, Kate! Editing to add: What I’m finding particularly interesting, is that while I didn’t necessarily feel like we’re supposed to be pitying Yozo while reading the manga, somehow I got the impression from the manga that this might be the case in the novel. So to hear that Furuya’s actually playing it straighter makes me think I’d actually like the novel very much. Yes, thanks! I wouldn’t say the manga lead me to pity Yozo, exactly, but I did sympathize that he’d evidently been warped in some way by his family. If you’re curious about the relationship between the manga and the novel, Serdar Yegulalp posted a great essay comparing the two: http://www.genjipress.com/2011/10/no-longer-human-vol-1-usamaru-.html. I definitely felt a few things click into place after reading it. Of course, *your* discussion also made me want to go back and re-read the manga; your observations about Furuya’s subtle visual cues (e.g. the drastic haircut) made me feel like I hadn’t “seen” the manga at all! I’ve always enjoyed the “Off the Shelf” column. Thank you for sharing such wonderful conversations with the rest of us! I’m glad you enjoy it! Thanks for reading!